Kawhi Leonard made his long-anticipated season debut Tuesday and looked to be in mid-season form, although his San Antonio Spurs fell apart in the fourth quarter without him and lost to the Dallas Mavericks 95-89. The Spurs' All-Star forward missed the first 27 games of the season because of a quad injury. He quickly displayed his all-around excellence, producing 13 points on 6-of-12 shooting and adding six rebounds, one assist, one steal and a block. Leonard did it all in 16 minutes as coach Gregg Popovich promised a gradual reintroduction. Leonard's lone offensive rebound was a tip-out to himself that led to a bucket for a 55-50 San Antonio lead, and Popovich pulled him for good soon after. The Mavericks, sparked by guard J.J. Barea's aggressive drives to the basket, opened the fourth quarter on an 8-0 run, went up 91-80 with 4:01 to go and held on to snap the Spurs' four-game winning streak as well as end their own three-game skid. Joel Embiid had 28 points, 12 rebounds and eight assists, and J.J. Redick scored 26 points as Philadelphia pulled out an overtime victory over Minnesota. Ben Simmons was held scoreless until 1:17 remained in regulation, but he ended up with seven points and eight assists for Philadelphia. The 76ers snapped a four-game losing streak by scoring the first six points of overtime and holding on in the back-and-forth game. Jimmy Butler scored a season-high 38 points for Timberwolves, who shot only 40.7 percent from the field. Karl-Anthony Towns had his league-leading 22nd double-double with 19 points and 16 rebounds, and Andrew Wiggins scored 20 points for Minnesota. 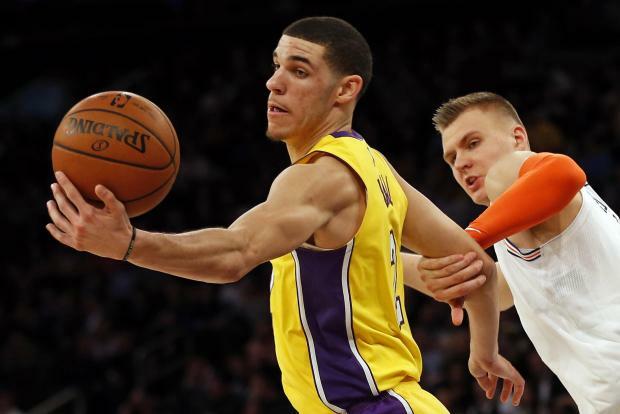 Kristaps Porzingis scored 37 points as New York emerged with an overtime victory over Los Angeles. Kentavious Caldwell-Pope paced the Lakers with 24 points. Los Angeles rookies Lonzo Ball (17 points, eight rebounds, six assists) and Kyle Kuzma (19 points) played well in their Madison Square Garden debuts. Kuzma hit a 3-pointer with 23.9 seconds left to tie the game at 99, but New York's Michael Beasley had two baskets and an assist on a Doug McDermott layup during a 69-second run in overtime to give the Knicks a six-point lead they would not relinquish. Setting a season high with 20 3-pointers, Cleveland topped Atlanta. LeBron James scored 25 points and tied a career high with 17 assists. He made two 3-pointers. Kyle Korver (19 points) drained six 3-pointers, and Kevin Love (17 points, 12 rebounds) added four treys, as did Jose Calderon (14 points, tying a season high). Taurean Prince paced the Hawks with 24 points, and Kent Bazemore added 20. Jamal Murray fired in 28 points and reserve Trey Lyles tossed in 20, leading Denver to the easy victory over slumping Detroit. Wilson Chandler scored 18 points, while Mason Plumlee supplied 10 points and a season-high 13 rebounds for the Nuggets, who never trailed. Gary Harris added eight points, six rebounds, nine assists and four steals. The Pistons lost their seventh straight, their longest skid since dropping 10 in a row during February and March 2015. Langston Galloway led Detroit with 18 points. Allen Crabbe shook off a rough shooting night to hit the go-ahead 3-pointer with 44 seconds left as Brooklyn beat Washington. Crabbe was among seven Nets in double figures, finishing with 13 points. He shot 3 of 15 overall, 3 of 14 from 3-point range on a night when Brooklyn made 23.3 percent from long range. Bradley Beal led Washington with 28 points but only scored three points in the fourth quarter. He shot 11 of 33 and missed all seven of his 3-point attempts. Zach Randolph scored 11 of his 17 points during the final five minutes, and his three-point play with 44.9 seconds left helped lift Sacramento past Phoenix. George Hill scored 18 points, and Buddy Hield contributed 14 points off the bench as Sacramento ended a three-game home losing streak. TJ Warren scored 18 points to lead the Suns, who have dropped four in a row and nine of their past 11. Reserve Mike James scored 17 points in 20 minutes, Tyler Ulis added 10 points, and Tyson Chandler had seven points and 10 rebounds for Phoenix.